CAIRO - An ailing, 83-year-old Hosni Mubarak, lying ashen-faced on a hospital bed inside a metal defendants cage with his two sons standing protectively beside him in white prison uniforms, pleaded innocent to charges of corruption and complicity in the killing of protesters at the start of his historic trial on Wednesday. The spectacle, aired live on state television, was a stunning moment for Egyptians, many of whom savored the humiliation of the man who ruled with unquestionable power for 29 years. After widespread skepticism that Egypt's military rulers would allow it, the scene went a long way to satisfy one of the key demands that has united protesters since Feb. 11, when Mubarak fell following an 18-day uprising. "This is the dream of Egyptians, to see him like this, humiliated like he humiliated them for the last 30 years," said Ghada Ali, the mother of a 17-year old girl in the city of Alexandria who was shot to death during the crackdown. "I want to see their heart explode like my daughter's heart exploded from their single bullet," Ali told The Associated Press, breaking down in sobs. It was the first time Egyptians have seen Mubarak since Feb. 10, when he gave a defiant TV address refusing to resign. In the courtroom, a prosecutor read the charges against Mubarak — that he was an accomplice along with this then-interior minister in the "intentional and premeditated murder of peaceful protesters" and that he and his sons received gifts from a prominent businessman in return for guaranteeing him a lowered price in a land deal with the state. "Yes, I am here," Mubarak said from his bed, raising his hand slightly when the judge asked him to identify himself and enter a plea. "I deny all these accusations completely," he said into a microphone, wagging his finger. The emotions swirling around the trial were on display outside the heavily secured Cairo police academy where the trial was held. A crowd of Mubarak supporters and hundreds of relatives of slain protesters and other Mubarak opponents massed at the gates, scuffling sporadically. They threw stones and bottles at each other while riot police with shields and helmets tried to keep them apart. About 50 supporters pounded on the steel gate trying to get into the compound, chanting "We Love you, Mubarak!" until police charged at the with electrified batons and dispersed them. For many Egyptians, the trial is a chance at retribution for decades of oppressive rule in which opponents were tortured, corruption was rife, poverty spread and political life was stifled. But for others, Mubarak was a symbol of stability. At the session's start, Mubarak, a sheet pulled up to his chest, was wheeled on a hospital bed into the defendant's cage, made of iron bars and a metal mesh. Though he was pale and his eyes were ringed with red, he appeared alert and aware of what was going on. He showed little discernible emotion. With him in the cage were his nine co-defendants, including his two sons — one-time heir apparent Gamal and wealthy businessman Alaa — his former interior minister Habib el-Adly, and six top former police officials. 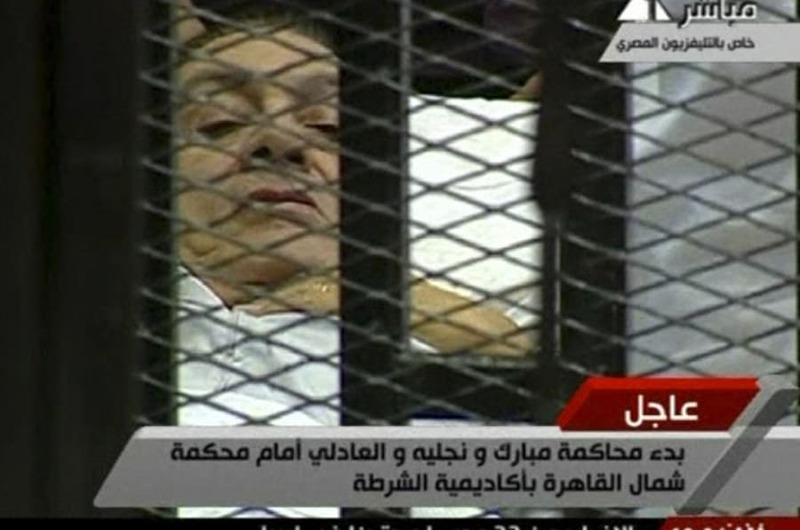 From time to time, Mubarak craned his head to see the proceedings. Other times, he crooked his elbow over his face as if in exhaustion. While the other defendants sat on wooden benches in the cage, Gamal and Alaa in their white prison uniforms stood next to their father's bed, at one point with their arms crossed on their chest seemingly trying to block the court camera's view of their father. The two sons each carried a copy of the Qur’an and leaned over to talk tot heir father. Defendants are traditionally held in cages during trials in Egypt. About an hour after the session began, there was a recess and the defendants were led out of the cage. Much of the session dealt with procedural matters, as the three-judge panel officially took the names of the lawyers involved in the case and heard motions from them. Up to the last minute, many Egyptians had doubted that Mubarak would actually appear at the trial. It was inconceivable that the man who vowed to rule the country until his last breath and who kept a near total grip on the levers of power, whose name once crowned public buildings around the country, could actually be brought to trial. The skepticism remain up until the moment early Wednesday when Mubarak was taken from his hospital room in the Red Sea resort of Sharm el-Sheikh to a military plane that flew him to a military airport in Cairo. From there, he was transferred by helicopter to the police academy where the trial was held. An official told state news agency MENA that Mubarak will stay at a hospital within the police academy compound during the trial to ensure that he attends the sessions. Mubarak has been living in Sharm since he was ousted and has been under arrest in a hospital there since April, reportedly suffering from heart problems. Doctors have reported that he is growing increasingly depressed. Mostafa el-Naggar, one of the leading youth activists who organized the anti-Mubarak uprising, called it "a moment no Egyptian ever thought was possible." "I have many feelings. I am happy, satisfied. I feel this a real success for the revolution, and I feel that the moment of real retribution is near," he told The Associated Press. The courtroom itself was divided. Relatives of the defendants sat in rows of seats near the defendants cage, made of iron bars and mesh. A fence running through the middle of the chamber divided them from the rest of the audience of around 300 people, including a few relatives of protesters killed in the uprising, kept far enough that they cannot shout or throw anything at the former leader. The Mubarak supporters outside were furious over the humiliation of their former leader, throwing stones at the screen showing the session. "We will demolish and burn the prison if they convict Mubarak," they screamed at hundreds of police and army troops backed by armoured personnel carriers. "He is our president and he is going to be found innocent," said one woman in the crowd, Tahami Luteifi. The trial came only after heavy pressure by activists on the now ruling military — one of the few demands that still unites the disparate protest movement. It answers, at least partially, a growing clamour in Egypt for justice not only for the wrongs of Mubarak's authoritarian regime but also for the violent suppression of the largely peaceful uprising, in which 850 protesters were killed. In February, as protests raged around him, Mubarak vowed he would die on Egyptian soil. The last time Egyptians saw him, he appeared on state TV, handing most of his powers to his vice-president but refusing to resign. He proclaimed he was "adamant to continue to shoulder my responsibility." The next day, his resignation was announced and Mubarak fled to a palatial residence in Sharm el-Sheikh. The ruling generals who took power from him — and who were all appointed by Mubarak before the uprising — appeared reluctant to prosecute him, but protests flared anew, pressuring action. In April, Mubarak was moved to a Sharm el-Sheikh hospital and put under arrest while his sons and former cronies were held in Cairo's Torah Prison. The prosecution is an unprecedented moment in the Arab world, the first time a modern Mideast leader has been put on trial fully by his own people. The closest event to it was former Iraqi leader Saddam Hussein's trial, but his capture came at the hands of U.S. troops in 2003 and his special tribunal was set up with extensive consultation with American officials and international experts. Tunisia's deposed president, Zine El Abidine Ben Ali, has been tried and convicted several times since his fall several weeks before Mubarak's, but all in absentia as he remains in exile in Saudi Arabia. Mubarak, el-Adly, and six top police officers are charged in connection with the killings of protesters. All eight could face the death penalty if convicted. The charge sheet said that Mubarak "allowed (el-Adly) to use live ammunition" in the crackdown on protesters. Separately, Mubarak and his two sons face charges of corruption. According to the prosecutors, the father and sons received five villas worth nearly $7 million from prominent businessman Hussein Salem in return for using their influence to get him a lower price for state land to build a resort complex in Sharm el-Sheikh. Near Tahrir Square, the epicenter of the protesters, a dozen people swarmed around newspapers at a stand, reading headlines about the trial. One man spit on a picture of Mubarak on a front page. "When he is in the cage and we know he is there, then we know we have started to put our feet on the path of justice," said the newspaper seller, Nabil Hassan, 65. "If he and his accomplices are in court, he becomes one of the people no different from anyone else facing justice. I have faith in Egyptian judges." By Hamza Hendawi AP correspondent Sarah El Deeb and Aya Batrawy contributed to this report.